See below for the complete “Heinz Magic of Food Show” booklet. It seems impossible that Heinz’s marketing execs would not have made the connection and perhaps they saw a perverse opportunity to get people talking about their product. The media of the time and even comedians would have struggled and contorted themselves to avoid release of any rancid references. Regarding any odious speculation, had the media supplied it, I’m certain Heinz would have denied it. But for fairgoers, the pressure to cut loose the humor inherent in the show’s location must have been irresistible. With that said, I’m going to take the high road and not break the silence on this pressing issue. To do otherwise would reek of cheap humor. 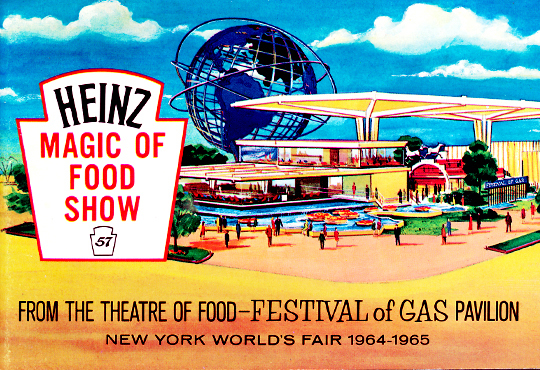 The Heinz Magic of Food Show recipe booklet was given out as a souvenir to visitors to the “Festival of Gas Pavillion” sponsored by the American Gas Federation. “Recipes prepared by The Home Economnics Department” of the H.J. Heinz Company. Sadly, no video seems to exist of the actual “Magic of Food” show. I’ll let you imagine what the audio would have sounded like. No “Message from Mr. Heinz,” or other pleasantries from the good people at Heinz. Instead, they let loose with an explosive torrent of recipes, starting with Saucy Ribs. 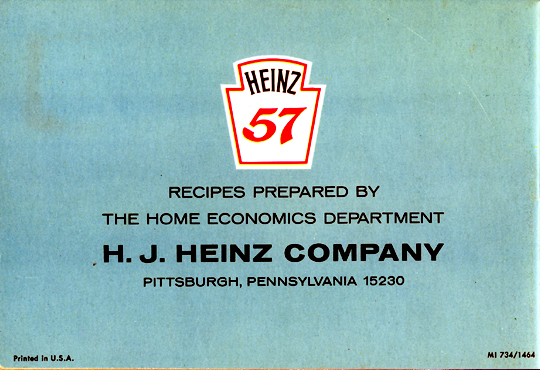 Note the “endpaper” on the right featuring some of Heinz’s fine products. Sadly, Heinz produced this booklet on the cheap and there’s no color inside, but there are some interesting recipes. And in deference to the “World” in Worlds’ Fair, there’s a strong current of international flair bubbling up from the deepest depths of the Heinz kitchen. “Beef Pasties” are no doubt inspired by Cornish Pasties, a delicacy from the tropical (really) southwest of England. The Pasties were a favorite of coal miners, who brought them down into the bowels of the earth every morning. By luncheon time, the pasties would be coated with coal dust, but when broken open would yield their savory fillings, clean and ready to eat. The crusts were then discarded. Cornish Pasties now have protected status in the United Kingdom. “Citrus Surprise Steak” and “Veal Lausanne.” Not much here but a question: When was the last time anyone found a recipe with “Surprise” in the name even the least bit appetizing? A French classic with an unmistakable twist. The original Gallic recipe featuring chicken with grapes in a fresh cream sauce is updated for the America palate. Heinz Condensed Cream of Chicken Soup stands in for the cream sauce. You can substitute an 8-3/4 ounce can of green grapes for fresh grapes if you’ve made the commitment to sever all your ties with the natural world. Don’t fear, “Crepes Colette” aren’t some menacing foreign plot against America. No, they’re simply thin pancakes filled with the Heinz Condensed Soup of your choice and chicken or Star-Kist Tuna. It’s OK to say you like them. While the name sounds like some forgotten Korean War battle (the one that led to the heroic last stand on Pork Chop Hill), I think something else is at work here. This recipe reeks of having been a “Marketing Requirement” to use the top product in the Heinz pantheon in a foreign-sounding recipe that wouldn’t frighten American audiences. The mix of fresh spices, onions and peppers actually sounds like it could be tasty. If you’re adventurous enough to make some, let me know. Little known fact: The last shot in the American Revolution was fired in 1964. Another mostly-canned/frozen recipe. The only redeeming thing about this recipe is that the beans mean it’s good for your heart. All kidding aside, middle class people of the early 21st century look nostalgically back on the 60s as a time when life was just plain easier. The truth is, we are working harder now, but not because life’s harder now, but because we want to eat more steaks and free-range chicken with basil risotto instead of “Newbury Beans and Fish Sticks.” The dirty little secret of the 50s and 60s is that middle class families ate meals like this and casseroles to help make ends meet. And they went on car trips or went camping at vacation-time – not junkets to the Caribbean or Europe or a cruise. So quit whining. More ho-hum seafood recipes. My only guess is that this booklet was planned and printed before the second Vatican council allowed fish on Friday. Nothing else could explain these unholy fish concoctions other than blind religious fervor. “Rainbow Salad” bursts forth in all its black and white glory thanks to the cheapskates in the Heinz marketing department. A little more color wouldn’t have cost that much more and the results would have been appreciated. Not to belabor the whole “Festival of Gas Pavilion” thing, but couldn’t they have chosen a lettuce-based salad rather than one that features cabbage? I’m just asking. And be careful not to slice yourself when cutting the cheese that this recipe calls for. “Turkey Waldorf Salad” isn’t remarkable in any way except that it calls for “1 tablespoon of pickle liquid.” Yum! Oddly, the “Saucisse Salad” sounds French, but Germany is in the driver seat (please: no jokes on the current state of the European Union). What could be simpler or more glorious? VH1 claims David Bowie was under the influence of this taste treat when he composed his breakout tune, “Space Oddity.” I’m not sure I buy it. More exotic recipes crafted from the same five or six basic ingredients most mid-60s housewives would have had on hand. “Cabbage Joes,” adds the third heat to the traditional Sloppy Joe. “Hot Dutch Tuna Buns,” oddly also features liberal helpings of cabbage. At least it’s something different if you can’t eat meat on Friday. “Love Apple Pie” answers the age old question of “how do I make something that includes apples and ketchup.” This is proof that there really is a fine line between love and hate. More desserts including gratuitous use of ketchup. Ketchup has no business being in either of the recipes on this page. Unless it is the “Business Need” to extend the uses of ketchup to sell more bottles of the stuff. I wonder how that worked out for them? Heinz leaves us without as much as a “thank you.” Instead, the parting shot is “Brunch Crunch,” a late breakfast medley of incompatible ingredients only notable for its lack of cabbage. Should it be served for breakfast or lunch? No, it should be served with great care and only after signed liability waivers have been received from you guests. Another lost opportunity. The only other page in full color and they give us a Heinz logo on a Tiffany-blue background. But they did win our hearts with this nifty little booklet that allowed the heady memories of the fair and the “Festival of Gas Pavilion” to linger in the air well beyond when visitors left the fair. And I’m proud of myself not to have sunk to the level of making jokes about the inevitable end result of consuming baked bean. So I can move on with my head held high, not under a cloud of shame and embarrassment.